The space-saving solution to home fitness! Your own little gym at home that helps you get a fitter, more toned body without taking up a lot of space. Staying fit lets you live life to its fullest. Great muscle tone, good endurance and other benefits of regular exercise keep you functioning at your peak in everyday life situations too! The problem is that gyms can be located far from home or work, they can be expensive, and even if you do manage to work your way around that you may find them too crowded. 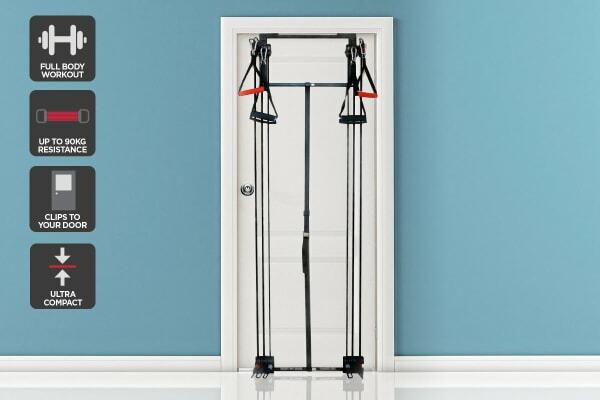 The Fortis Door Gym Set lets you overcome all of the above problems and finally gives you a great way to exercise at home without breaking the bank or taking up a whole lot of space at home. Clip on to any door! 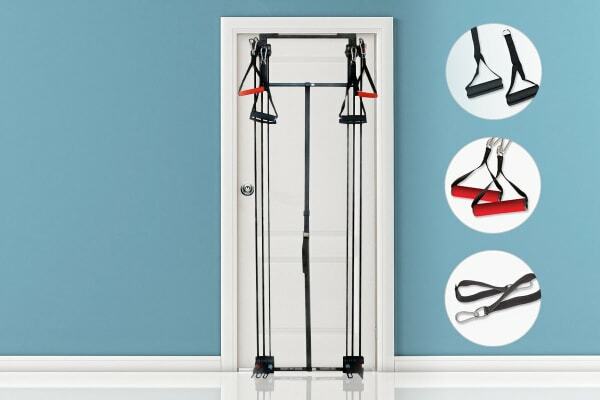 A simple yet perfect solution to your exercising requirements, this convenient clip-on Door Gym Set keeps clutter out of your way and lets you avoid little accidents like tripping over your dumbbells and bars because of a lack of space. 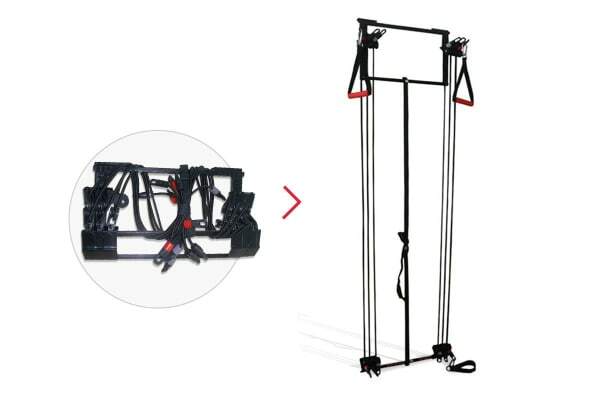 It can be stored by folding into a neat, convenient size and when it’s time for exercise, all you need to do is to clip it on to the to the top and bottom of any door, and start your workout! 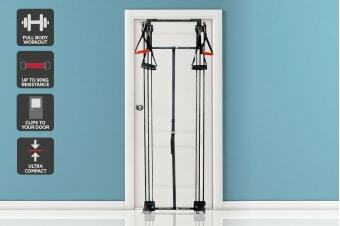 This clever Door Gym uses power cords instead of space-occupying dumbbells to provide resistance equivalent to up to 90kg! So, you get the same benefits without any of the clutter or fuss. It’s easy to get the right amount of resistance for your strength and level by simply changing the cords! You can slowly increase resistance as you build up your strength. Work through a variety of exercises that strengthen both your upper and lower body! Sweat it out with Bicep curls, chest fly, lat pull down, shoulder press, squats, lunges, crunches and more thanks to the power cords and included hand and ankle grips. Fits doors of up to 210cm in height.